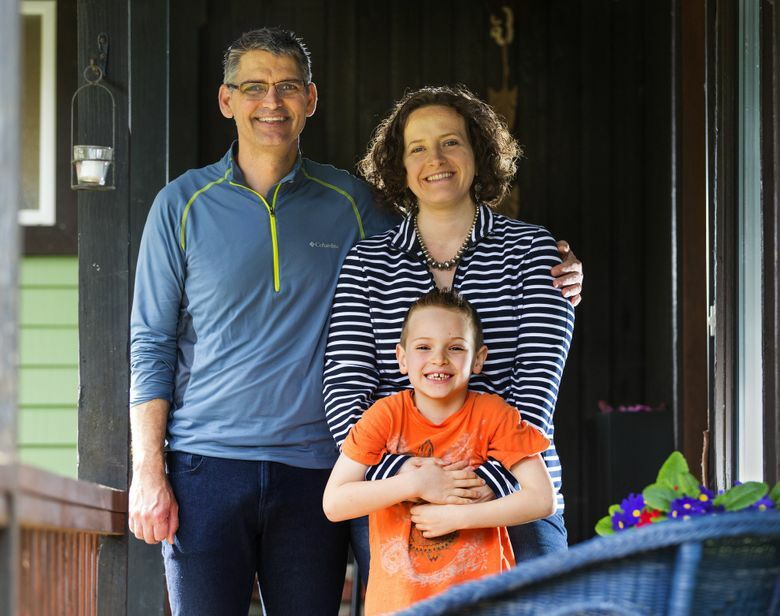 Though they already have built an impressive nest egg, Jennifer Ferdinand and Todd Parker are concerned about how much a college degree will cost when their now 7-year-old son enrolls. Jennifer Ferdinand and Todd Parker have steady jobs, pensions and retirement accounts. They keep their spending in check and expect to pay off their home mortgage after 15 years. In short, the Kenmore couple are well positioned for the future, with a notable exception: paying for their son’s college education. Jonah, who turns 7 this month, could enroll as a college freshman as soon as 2027, or 12 years from now. Would you like some free financial advice? IF YOU WOULD BE INTERESTED in a free financial makeover in exchange for having your story and photo published in The Seattle Times, answer a few questions at seattletimes.com/your-money-survey. His parents are committed to paying for his college, yet they had not set aside any money to do so. Ferdinand, 42, and Parker, 46, were stopped by several things. They found the complexities of college-savings plans daunting. For a while, the couple thought they could cover the cost with their household cash flow. Then their own retirement savings seemed threatened by dramatic increases in the cost of a four-year college degree. Tuition and fees at Washington state’s public-research universities jumped an average 9.5 percent a year for the 10 years ending in 2014, according to the state Guaranteed Education Tuition program, or GET. At the University of Washington, a state-resident freshman could expect to pay $27,112 to attend the Seattle campus during the current academic year, UW estimates. That includes tuition, fees, room and board, as well as such things as books, supplies and personal expenses. Inflation and tuition increases keep driving the cost higher. By the time Jonah graduates from high school, the expense of earning a four-year degree at UW’s Seattle campus could exceed $200,000. To find out how to finance their retirement and their son’s education, the couple turned to the Puget Sound Chapter of the Financial Planning Association. It referred them to Ted White, a financial planner with Goddard Financial Planning in Seattle. White did a 53-page analysis of the couple’s finances that examined such things as net worth, cash flow, insurance, retirement and investments. “They’re in a good spot,” White said. Ferdinand and Parker combined earn about $198,000 a year before taxes. They owe $145,000 on their home, which has a market value of about $370,000. Ted White, a financial planner at Goddard Financial Planning in Seattle, has three tips for families who want to help pay for their children’s undergraduate degrees. • Consider saving for college with one of the 529 plans offered by every state and the District of Columbia. Parents with young children and low tolerance for investment risk might consider a prepaid-tuition plan. Families with older children who are more comfortable with investment risk might consider a college-savings plan. • Save between 65 and 70 percent of the cost of college in a 529 plan. Put the remainder in a taxable investment account. That reduces the odds of putting too much money in a 529 plan, which could lead to penalties for noncollege withdrawals. • Put a higher priority on saving for your retirement. You can get a loan for your children’s college, but not for your own retirement. Both of them are savers, with about $709,000 in various retirement accounts. Just as important, they are among the dwindling number of workers with pension plans. Ferdinand’s plan is with the federal government, while Parker, a teacher, has a pension through the Northshore School District. White did the math and estimated the couple’s net worth at $975,000, nearly three times the Federal Reserve’s average for households in their age bracket. But that didn’t solve the problem of how to pay for Jonah’s college education. White estimated how much it would cost for Jonah to earn a four-year degree from UW’s Seattle campus if he enrolls as a freshman in 2027. Using an annual inflation rate of 5 percent for college costs, White arrived at a bachelor’s degree price tag of $208,990. He urged Ferdinand and Parker to open a 529 college-savings plan and begin socking away $500 a month. Every state, including Washington, offers at least one type of 529 plan, and the plans do not come with residency requirements. White recommended saving with the Utah Educational Savings Plan because of its low fees and its asset manager, The Vanguard Group. So Ferdinand and Parker opened an online account with the Utah Educational Savings Plan and set up payroll distribution of $250 from Ferdinand’s semimonthly paycheck. Following the financial planner’s advice, she reduced her monthly income-tax bill by $400 by switching from a Roth Thrift Savings Plan at work to a pre-tax Thrift Savings Plan. That freed up most of the money for her $500 a month contribution to her son’s college savings plan. When Ferdinand and Parker save more than 65 percent of the cost of Jonah’s schooling, they should open a joint taxable amount for saving the rest, White advised. That would reduce the risk of putting too much money into the college-savings plan and getting penalized for noncollege withdrawals. Separately, White urged Ferdinand to get disability-income insurance to help cushion the financial blow to the family if she is unable to work. She bought a $64-a-month policy that insures 80 percent of her salary for as long as three years. George Erb is a Seattle freelancer.